Inky Paws Challenge #93 Winner! 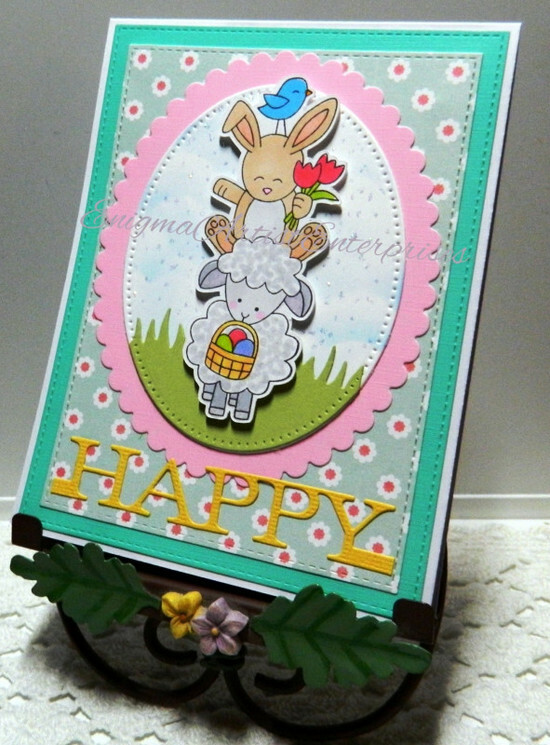 Enigma Artist creates this delightful spring card with an Easter theme. 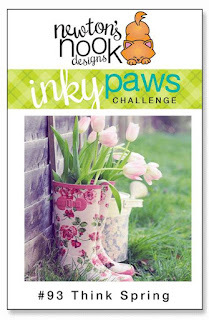 She creates several layers using pastel papers as well as a fun floral pattern paper. In her center oval, she creates a soft sky and grassy background on which the spring critters from the Spring Pile Up stamp and die set are having some fun! Love how she made the sweet lamb look fluffy! 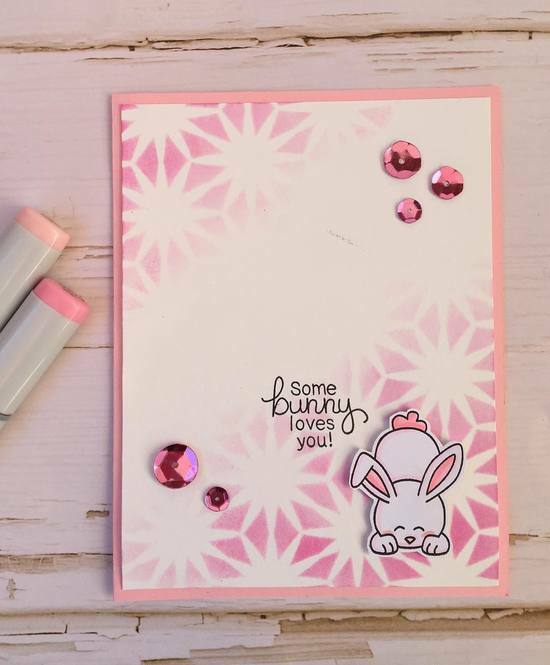 Meghan brings us this pretty in pink bunny card! Using a stencil , she intermittently inks her background. She then adds her little white bunny from the Bitty Bunnies stamp and die set and adds a pink fluffy tail on her. She adds pink jewels and sequins to add bling! This is such a happy card with all the pinks! Nancy's clean and crisp card is a fabulous way to welcome spring. Using the pointillism technique, she colors the sweet lamb from the Woodland Spring stamp and die set in shades of gray. She frames the lamb by stamping the sentiment over his head and adds the floral spray below. Shes a few clear jewels to balance out the card! So sweet and precious! 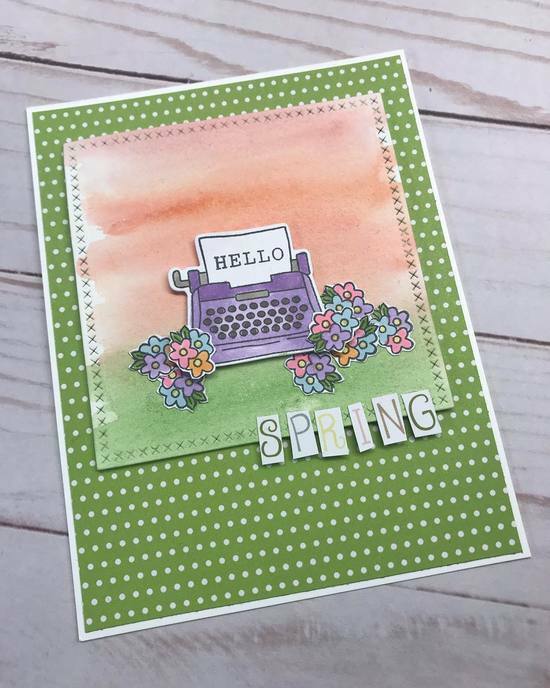 Vicki creatively designs this spring card around a typewriter! Using a fun green and white polka dotted background, she adds a water colored layer in soft pastels. She then adds the typewriter ( My Type stamp and die set) with the hello sentiment "typed" on the paper. She tucks the typewriter in around all the fresh spring flowers. So creative and fun! Danni brings us the all the bright colors of spring! 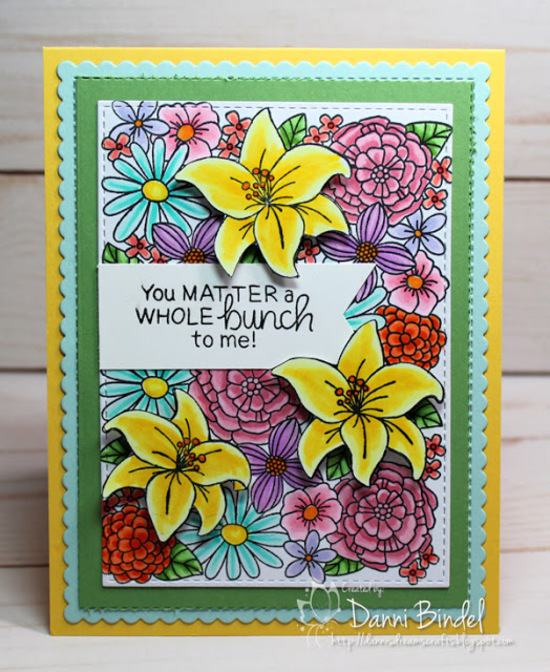 Using the Blooming Botanicals stamp set, Danni wonderfully shades the flowers in a plethora of fun, fresh colors. She stamps the sentiment on a banner and then adds dimension to her card by stamping and fussy cutting additional flowers from the stamp set and adding dimensional tape. Such a beautiful garden on a card! Donna brings us this gorgeous spring card with her stunning color scheme. She adds a black and white striped layer to her background and then stamps the floral images from the Lovely Blooms stamp set in a pretty teals and lavenders. The placement of her flowers and leaves frames the sentiment from the Birthday Essentials stamp set. 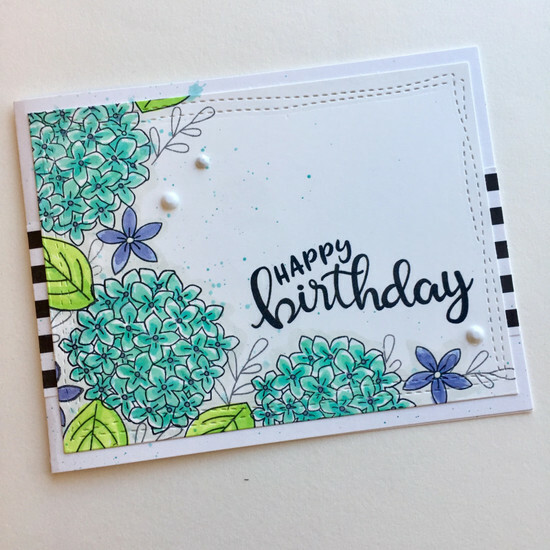 She adds some splatters and enamel dots to finish this lovely card. Thanks again to everyone who entered - It's really so much fun to look through all the entries and see everyone's ideas! If you didn't win this time, we hop e you'll play along again next time! You can always find our most current challenge here. Congrats to the winner! And everyone who was picked! Honored to be picked a fav! Happy Dance to all the winners! Thank you for choosing my card as a favorite! You made my day! Congrats to the winner and other favorites!